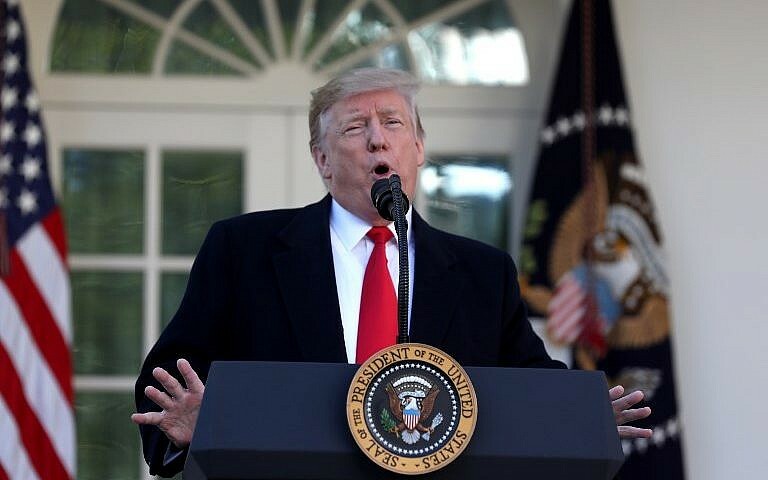 WASHINGTON — US President Donald Trump on Wednesday attacked the US intelligence services as “naive” and “wrong” on the threat he says is posed by Iran. “Perhaps Intelligence should go back to school!” Trump said in a blistering series of tweets. “The Intelligence people seem to be extremely passive and naive when it comes to the dangers of Iran. They are wrong!” Trump tweeted. When @realDonaldTrump‘s own intelligence agencies contradict what he, the warmongers in his admin, and the Israelis say about Iran. He should have listened to the EU, the UN, and former US officials all along. Although especially vehement, it was not the first time Trump has publicly criticized his own intelligence services. The broadside, which included separate tweets where Trump praised the success of his policies in Syria and North Korea, followed testimony Tuesday by top intelligence chiefs that were widely seen as contradicting the president’s rosy assessments. In a hearing on global threats at the Senate Intelligence Committee, the top officials took issue with Trump’s assertion that the Islamic State group has been defeated, and that North Korea can be convinced to forego its nuclear weapons. They also challenged the president’s claim that Tehran is actively seeking nuclear weapons, the justification Trump gave for withdrawing last year from a multilateral treaty on Iran. They underscored again that they believe Russia meddled deeply on Trump’s behalf in the 2016 presidential election — which he has repeatedly denied — and can be expected to do the same in 2020. The new European scheme was originally intended to allow Iran to sell oil to the EU on a barter basis but, with Europe now buying very little Iranian oil, it is now aimed at small and medium-sized companies. Iran regularly holds exercises to display its military preparedness and has vowed to respond strongly to any attack by Israel or the United States, both of which view it as a regional menace. Sky News Arabia reports Hezbollah putting off payments to members, with some in organization receiving only 60% of their salaries • With Iran hit hard by U.S. sanctions, Tehran’s annual $1 billion budget for Hezbollah may also be in question. Are U.S. sanctions beginning to have an impact on Hezbollah? Sky News Arabia has reported that the Shiite terrorist organization has postponed a number of payments, including to Hezbollah members as a result of financial difficulties. According to the report, which appeared on Sky News Arabia’s website, Wednesday, employees of Hezbollah’s media, education, medical and even military systems have complained of deep pay cuts of late, with some reportedly receiving only 60% of their salaries last month. Despite their increasing frustration at the situation, Lebanese media outlets and workers whose salaries have been cut have refrained from publicly criticizing Hezbollah out of concern doing so would damage the organization’s standing. According to Sky News Arabia’s sources, Hezbollah is concerned by increasing U.S. sanctions as well as growing EU efforts against the organization. Sanctions imposed on Iran have also put a dent in Hezbollah’s cash flow. According to Israel’s Ambassador to the U.N. Danny Danon, Iran provides Hezbollah with an annual budget of $1 billion. With Iran in the midst of a financial crisis, Hezbollah may not be able to count on Tehran investing all of that money in the organization in the future. At a ceremony marking 40 years to the Islamic Revolution at Tehran’s Shah Mosque earlier that day, Iranian President Hassan Rouhani admitted his country was in the throes of the worst financial crisis it had faced in 40 years. He blamed economic pressure from the U.S. for Iran’s monetary troubles. The U.S. has imposed sanctions on Iran in recent months following U.S. President Donald Trump’s decision to withdraw from the 2015 nuclear deal in response to Iran’s military activities across the Middle East, ballistic missile program and concerns it would renew its nuclear weapons program later down the road. As the Islamist regime in Iran marks 40 years to its establishment, local leaders there will admit there is not much reason to celebrate. They talk openly of their fears of an uprising and threaten that attempts to riot will be met with an iron fist. In the streets of Tehran and other major cities throughout the country, protesters call to “leave Syria alone, deal with us!” and demand Iran end its financial support for Hamas, Islamic Jihad and other Palestinian organizations. The country’s coffers are quickly growing empty, its oil exports increasingly on the decline. While the U.S. may not meet its stated goal of bringing Iranian oil sales to zero, Iran is not being paid for the oil it does manage to sell in U.S. dollars. China, India and Turkey are willing to pay for Iran’s oil in either local currency or goods, but these goods cannot provide for all of Iran’s needs. While Europe was very much interested in continuing to engage in trade with Iran, almost all of the continent’s large companies have already cut ties to the country. Iran’s leaders are now openly talking about the dire straits the country is in. In cabinet meetings, President Hassan Rouhani has spoken about the increasing problem of poverty in the country and the growing impact it is having on the public, including the middle class. Noting he was born into a poor family, Rouhani has noted he is well aware of the pains of poverty. Even radical religious figures have spoken out about the issue, although they attribute it to the inefficacy of Rouhani and his advisers. 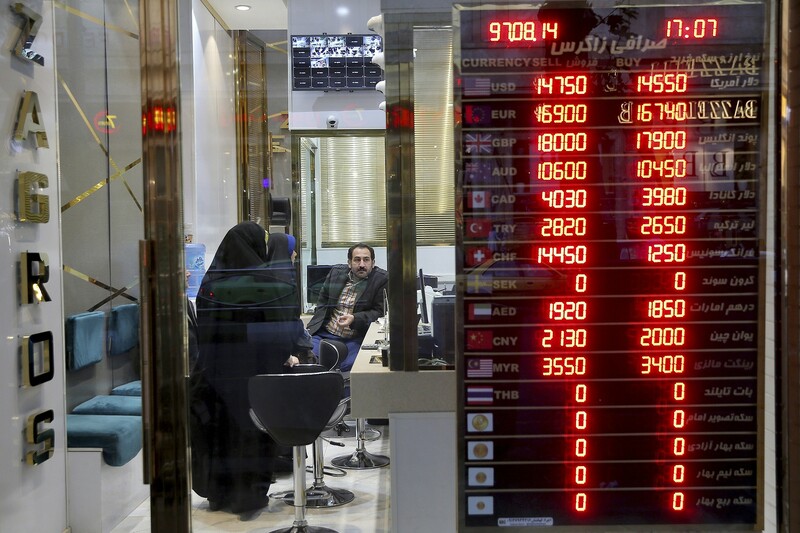 The Rouhani government has been busy in recent weeks working on a budget proposal for the coming year, and in light of Iran’s financial woes, budget cuts across all fields and sectors would seem the natural way to go. But Iran’s institutions of influence are trying to squeeze everything they can out of the government, going so far as to demand increases to their budgets. Religious figures are leading the struggle on this end at a time when media outlets are reporting that education, health and welfare in the country are already suffering as a result of a lack of funding. It is still hard to predict if and when the regime will fall, but it is safe to say the ayatollahs are on shaky ground. In the past two years, protests in Iran have seen demonstrators shout, “Death to the dictator!” While the regime has so far succeeded in keeping the protests under control, the next time their anger boils over, it could lead to the collapse of the regime. It is not only the United States but also Arab states that are working toward this end. According to foreign reports, Israel is involved as well. Menashe Amir is an expert on Iranian affairs and former head of the Israel Broadcasting Authority’s Persian language division. Over the past 40 years, it has become clear to Iran’s citizens that while the radical and conservative religious ideology of the ayatollahs remains intact, the same cannot be said of the Islamic Revolution’s promises of reform and change. The establishment of the Islamic Republic exactly 40 years ago was a revolutionary success and a resounding intelligence failure. Western intelligence agencies, among them the Mossad, which for years maintained close ties with the monarchist regime in Tehran, did not correctly assess the street’s disgust with the shah’s continued rule until the very last minute. One can also assume that neither the Shah, who was forced to leave Iran on Jan. 16, 1979, nor Ayatollah Ruhollah Khomeini, who returned to Iran less than two weeks later, expected things to develop so quickly. Two months after Khomeini’s return from exile, millions of impassioned Iranians voted to replace the monarchy with a revolutionary Islamic regime. The decision to raise the Israeli-Palestinian conflict to the top of the Iranian Revolution’s agenda and enlist to assist the Palestinians with money and arms was no accident. Khomeini believed that the only way to turn Shiite Iran into the leader of the Islamic world was to look for the common denominator that could unite the Sunnis and the Shiites under one flag, and that was hostility toward Israel. Iran declared Al Quds [Jerusalem] Day an annual event, and late PLO leader Yasser Arafat was Khomeini’s first guest at his Tehran office. But over the past 40 years, it has become clear to Iran’s citizens that while the radical and conservative religious ideology led by Khomeini and his successor Ayatollah Ali Khamenei have remained intact, the same cannot be said of the revolution’s promises of reform and change. A majority of the country’s oil profits were pocketed by senior religious figures and members of the Revolutionary Guard Corp. A substantial amount of the money was also invested in the effort to develop nuclear weapons and subversive activity across and beyond the Arab world. But it did not make it way to Iran’s lower and middle classes. Waves of protests against religious tyranny and the silencing of opposition and in favor of far-reaching reforms to the structure of power, like the Green Movement in 2009, were suppressed with an iron fist and were not given outside support from, say, former U.S. President Barack Obama. But the December 2017 protests suffered from a lack of unifying leadership and possibly concerns of entering a direct confrontation with security forces. But there is now a younger generation in Iran that was born after the revolution. Members of this generation are sick and tired of religion and want genuine freedom, without veils and limits on freedom of expression. They are interested in opening up their country to the West and the rest of the outside world. At some point in time, this critical mass will burst out and try to bring about fundamental change to the regime. As it stands, despite the financial crisis, the regime has shown no sign it intends to relinquish its efforts in Syria, which have cost the government billions of dollars and could escalate into a confrontation with Israel on Syrian soil. Four decades after fleeing, Iranian-Israelis reflect on pro-Western country that transformed into Shiite theocracy • “Iran had ATMs and color TV in the 1970s, when those things were considered novel,” recalls Nissan Soleimani, who left at 15. Koby Shaulian, 47, made aliyah after the revolution when he was 15, purely for Zionist reasons. He says that the founder of the republic, Ruhollah Ayatollah Khomeini “was against the Zionists, but had no problem with Iran’s Jews so long as they accepted the Iranian flag.” According to Shaulian, he has only fond memories of growing up in Isfahan.